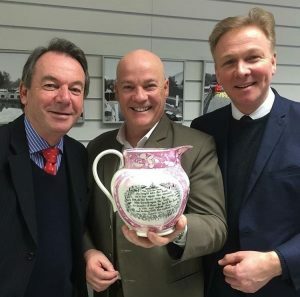 Kop Hill Climb Festival is delighted to announce that TV antique experts Eric Knowles, Paul Hayes and Tom Keane will be attending the event on both days, representing the Swan at Tetsworth Antique Centre and Auction Rooms. Antiques Roadshow veteran Eric, alongside Paul and Tom, will be offering free valuations at the Swan’s exhibition stand, so have a rummage in your attic and bring along that old vase, painting or silver jug you have forever intended to have identified and valued. You never know, it might well equate to two weeks in Barbados or whatever your dream destination might be. Eric is specialist in ceramics, glass, Art Deco and most things Oriental, whilst Paul concentrates on jewellery, silver and watches and Tom has a detailed knowledge of paintings and furniture. No need to actually bring your grandfather clock or dining table as images on your IPad or phone are invariably adequate, whilst if you have a house full of items on which you need advice, local home visits can often be arranged with no obligation in the days following the event. It may get busy, so please try and bring items that will fit into a large carrier bag. Meanwhile, feel free to bring out your Faberge, Cartier and Lalique as Eric, Paul and Tom tell us they need to feel wanted!